THE PICTURE ON THE COVER—Vriesea × 'Polonia'—This very handsome Belgium hybrid was brought from Europe by David Barry, Jr., who took this photo of one of his plants. This is a cross made by M. Charles Chevalier and he makes mention of this plant in his article "Hybrid Bromeliaceae in Europe," Bromeliad Society Bulletin, I, 3, p. 19. This is undoubtedly one of the most charming of all Vriesea hybrids. T IS THE GENERAL consensus that this is one of the most spectacular of all Billbergias. A large plant with leaves almost three feet in length and a brilliantly pink‑bracted inflorescence measuring over two feet, it certainly is a highly desirable bromeliad. It is very similar to B. porteana, except that its reddish brown, stiff leaves are beautifully marked. It is a favorite plant in Venezuela, where the natives grow it on the trees surrounding their homes. This Billbergia occurs only at lower altitudes, generally on cliffs facing the sea, where the climate is hot and dry. It is never found in tropical cloud forests. It is hardy outdoors in southern California. E MEMBERS, who live in the New York area have a plant-growing problem which is peculiar to us. Most of us, with few exceptions, live in apartment houses with poor lighting conditions and an excessive dryness in the winter due to the steam heat with which our homes are warmed. Most of us, also, cannot grow our plants out of doors in the summer, which makes it extremely difficult to establish sturdy leaves and flower buds. In spite of these seemingly insurmountable obstacles, many of us do grow a great variety of bromeliads, including many of the so-called difficult ones, and we not only have healthy plants but we bloom them, also. Three things are primarily necessary in order to grow bromeliads: proper light, proper moisture, and space to grow the plants. The following is what I found to be successful in my circumstances; I pass them along for what they are worth. Since I must assume that this article will be read by genuine enthusiasts, I must also assume that more than just a few bromeliads will be grown. One of my specialties is Tillandsias. In order to grow more than 100 different plants, I have worked out a method to utilize every bit of window space. I am fortunate in having a large picture window in my living room with a southern exposure. Instead of drapes or curtains, we hang a bamboo trellis from long projecting arms in the window. (see Fig. 1.) All the Tillandsias are fastened to pieces of hapuu tree-fern. Each slab of hapuu is attached to a length of soft, heavy iron wire which is bent to form a hook to suspend the plant from the bamboo crosspieces. The window ledge is reserved for potted bromeliads which are coming into flower and need the direct sunshine for "coloring-up" (this will be explained later in the article). This "bamboo curtain" can be quite attractive. If the bamboo trellis is made of two individual sections, each of which is suspended from a swinging drape holder on each side of the window, the trellis can be easily moved for access to the window. 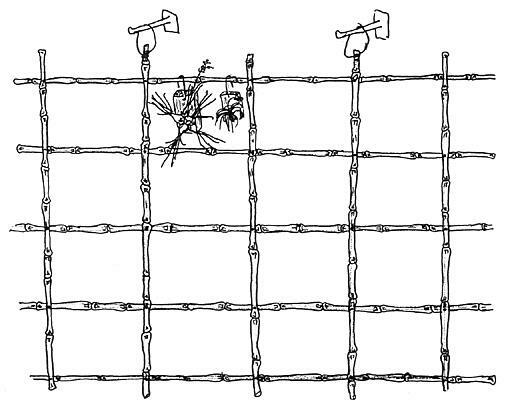 Figure 1—Illustrates one method of constructing bamboo trellis for hanging epiphytes. Two are shown on hapuu slabs suspended from the upper bar of the trellis by means of soft malleable black iron wire. Another method of growing bromeliads is on driftwood or tree-fern arrangements. I have found cholla sections to be very effective. In Vol. XIII, No. 4, page 83 of the Bromeliad Bulletin, there is a photo showing a tree I made of cholla pieces glued and wired together. This tree supports more than 30 large bromels and is set in concrete in a brass container on casters, so it can be moved about. The cholla is stuffed with a mixture of sphagnum and German peat moss. Eventually, the roots of the bromeliads will grow through the interstices of the cholla and will be able to take hold in the stuffing. The mosses can hold a lot of moisture without getting too soggy. One of the simplest methods of growing a great quantity of bromeliads is on tables under lights (see Fig. 2). This is not too attractive, but it is undoubtedly the easiest and the least expensive of all the methods I use. Next to the space problem, the next most difficult item in growing bromeliads is maintaining a proper moisture and humidity balance in the growing area. The first thing I did was cut off the heat in the living room. This room is properly and sufficiently taken care of by the heat which seeps in from the other rooms. The easiest and best way to establish and maintain a proper humidity for bromeliads is through the use of an electric humidifier which will vaporize a few gallons of water into the atmosphere every day. Another method is shown in Fig. 3. Make a simple frame of scrap lumber large enough to cover the area decided upon. To this, tack a sheet of plastic loose enough to rest on the bottom. Fill the cavity with pumice rock chunks and thoroughly soak them with water. The potted plants can be placed on this support and a certain amount of dampness will permeate the air. Another method is to use a hand vaporizer a few times a day. This is practical when only a few plants are grown. To the water which is used in the electric humidifier or the hand vaporizer, a complete plant food can be added. This will help to feed the plants. Every Sunday, I fill the bathtub with water. I then unhook all my Tillandsias from the bamboo and dunk them for a sufficient time to permit the hapuu to soak up the optimum capacity of water. Since the average bathtub will only hold about 20 to 25 plants at a time, I have to do the soaking in relays. It is a good idea to get a plastic washtub to carry the wet plants in, back to the bamboo, otherwise a sloppy wet floor will cause a domestic crisis. Of course, normal watering into the tanks of the bromeliads and into the flowerpots will be a matter of routine. 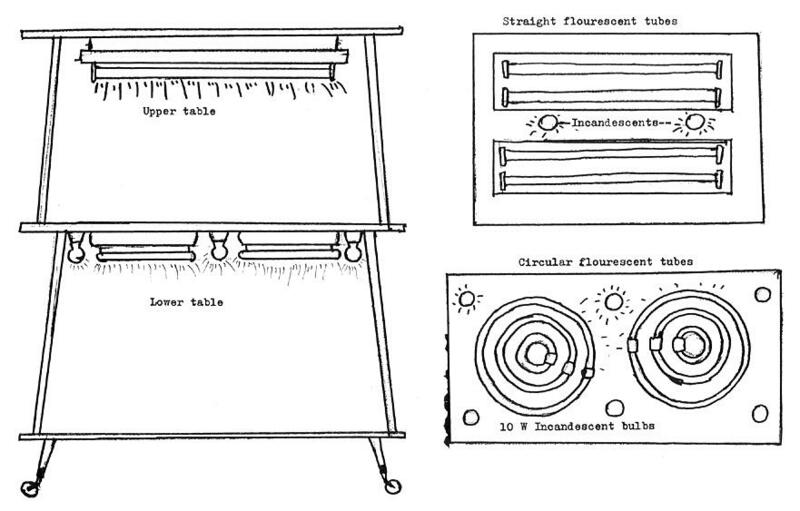 Figure 2—Illustrates a tiered table set-up for growing potted plants. Tables are about 5 x 3 feet and the tops are made of 3/4-exterior plywood. The straight tubes on the upper table give off 160 watts of light. The lower table, using circular tubes, gives off 192 watts of light. Proper lighting of bromeliads can be rather tricky, and is open to a lot of controversy. In order to grow a great number of bromeliads indoors, it is necessary for us to rely to a greater or lesser extent on some form of artificial light. Since incandescent light gives off an immense amount of heat, fluorescent tubes or circles are almost always chosen. There has been much material, both pro and con, written about the new plant growing bulbs such as "Gro-lux". I can only give you my own experiences using these lights. I must confess that as far as bromeliads are concerned, these lights are of no especial advantage. With every 100 watts of fluorescent light, mix in 10 to 15% incandescent light. On seedlings and very young plants, the lights should be no more than 8 or 10 inches away. In the case of larger plants, the lights can be 12 to 15 inches away. The lights are connected through an automatic timer which turns the lights on and off without any attention. These are set to give a least 12 to 14 hours of light a day. Naturally with so much steady light, more water and more plant food than usual is necessary. I prefer the multiple circular fluorescent fixtures, as these concentrate a tremendous amount of light in a given space. Now comes the great flaw in fluorescent lighting, at least, as far as I have discovered in the case of bromeliads. In my experience, the plants will grow and even bloom under artificial lights but they do not color up too well. In the early part of this article, I mentioned reserving the window ledge for "coloring up" space. When it is time for the plants to color, I move them to the sunny window. Somehow it takes natural sunlight to redden the leaves of Neoregelias, Cryptanthus bromelioides tricolor, Vriesea splendens spikes, Guzmania lingulata inflorescence, and many of the Aechmeas. Figure 3—Sketch shows frame constructed of 4 pieces of scrap 1" lumber. at least 2 inches wide and long enough to fill the desired space. A sheet of heavy gauge waterproof plastic is loosely placed inside of the frame to form the bottom and is fastened by tacks to the upper edge of the frame. The excess plastic is allowed to extend over the sides of the frame and if tucked under will effectively cover the bare wood. Large pebbles, pumice rock, gravel or vermiculite is used to fill in the frame and when this material is soaked in water, it will give off moisture over a long period. One more thing is necessary to insure healthy growth of bromeliads, and that is proper ventilation. Of course, in the summer time, this is no problem. In the winter, however, this can be rather risky in the New York area. I have solved this problem in my case by opening the windows in another room and by the use of electric fans circulating fresh air into the room where the plants are growing. Naturally, on the days when the weather is too treacherous, this procedure is omitted. All the above methods assume that one starts with healthy young plants. While it is possible to nurse sickly plants back to good health in a greenhouse or out of doors, it is a difficult thing to do in house horticulture. Besides, space is too precious to waste indoors. As one can gather, it takes a lot of effort to grow bromeliads indoors, but I am assuming that this is being read by the same sort of "Bromel-nut" that I am. We are prepared, even anxious to exert time and energy to cultivate our favorite plants. With care, all of the so-called difficult types can be grown successfully in the home, including the Tillandsias, Guzmanias, Vrieseas, Nidulariums, etc. The most important ingredients include love for bromeliads, a willingness to work, and a great amount of patience. I almost forgot to mention the most important ingredient—a loving and understanding mate. Fluorescent Light Gardening by Elaine C. Cherry, D. Van Nostrand Company, Inc., New Jersey, 1965. Hard cover. $6.95. For all those who must garden indoors this book will be of especial interest and value. The author, well known for her work with Gesneriads, writes from personal experience, so her book is a practical one. She explains why fluorescent light is the best light for an indoor garden and tells exactly how one can raise a wide variety of plants from African violets, begonias, cacti, ferns, geraniums to orchids and even roses. Unfortunately, her knowledge of bromeliads seems to be limited, but the book is highly recommended to those who wish to grow plants other than bromeliads in this manner. The book is conveniently divided into three parts. Part One describes readily available equipment for a fluorescent light garden; Part Two has to do with the environment for such planting and cultural practices; Part Three gives detailed information as to the individual needs for several hundred plants that have been grown successfully under artificial light. A helpful Appendix lists the names and addresses of more than a hundred dealers in plants, garden supplies, and fluorescent light equipment for indoor light in a given space. Although this volume is almost encyclopedic in scope, it is written in a highly readable and enjoyable style. Even though the reader may not use fluorescent lights for his indoor gardening, he can gather much valuable material that will be of great aid in growing all kinds of plants indoors. As a case in point, one is referred to the chapter "Culture," which contains a number of tables regarding potting mixes, pot sizes, fertilizer analyses, etc. LD PICTURES are always interesting, particularly when they have to do with our favorite plant family. As part of this issue is devoted to the pineapple, our Director in Paris, M. Marcel Lecoufle, has sent us this fascinating photo. He writes: "This plate was published in 1690 in an old book whose title is Voyages et Aventures de Francois Leguat en deux Iles descries des Indes Orientales. The islands referred to are Rodriquez, where no human being had ever lived, and Mauritius, where the author was held prisoner. This book was written in old French and the descriptions are interesting to read. It is said that one century after the discovery of the New World, Ananas were 'commercially' cultivated in the following islands: Ste. Helene, Mauritius, and Reunion. Leguat says that the Ananas 'comes out of the earth like an artichoke; the 'seeds' come into the bunch which crowns the fruit. The plant bears one single fruit commonly as big as a melon, shaped like a 'pine apple' and 'shining in the showiest and brightest colors. One cannot tire of admiring the fruit. The leaf is large, thick and armed with spines on both sides similar to an Aloe. It is said that the Brazilian Ananas is different from the one described here, growing small leaves between each seed of the fruit ....' "
Pineapples make handsome container specimens. Ananas ananasoides var. nana is a true pygmy. UCH BETTER KNOWN on the table than in the flower garden, and of course the best known of the terrestrial bromeliads, are the pineapples. The Indian name for pineapple in Brazil where it is native, is abacaxi (a-bak-a-she). If it is a pineapple which is not edible, they may call it either "Gravata" or "Caraguata," these terms being used, mostly, for spiny plants that might be utilized for their fiber. Gardens in the sub-tropics should have many more bromeliads and certainly more of the genus Ananas which are not only decorative but useful in being edible. Their great long lasting fruit makes a delightful decoration in the garden that can grow them. 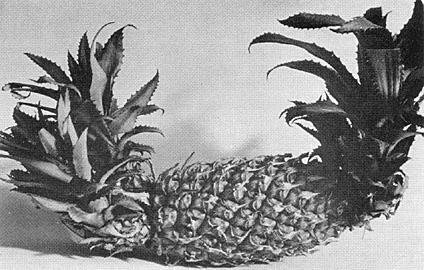 This pineapple fruit head rises out of the center of the spiny leaves on a strong stalk which holds the fruit proudly erect. The fruit is topped with a small rosette of leaves which form a miniature of the mother plant. And this "top" in turn if planted grows and becomes a mother plant which produces fruit, fulfilling its cycle of maturity. Nature, in this instance, does not limit her means of reproduction to one method. She does not risk the chances of the top of the fruit being destroyed so the plant also sends out from the base suckers, which root and soon grow into another plant. In general, the other terrestrial bromeliads grow and reproduce very much like the pineapple. Most other forms in this family send off side shoots soon after the fruit matures and within one year or so the old matured sections gradually die. Ananas ananasoides var. nana, the smallest pineapple in the world, is not edible. The fruit, from one to two inches long has the delicious pineapple fragrance, but is small and too hard to eat. 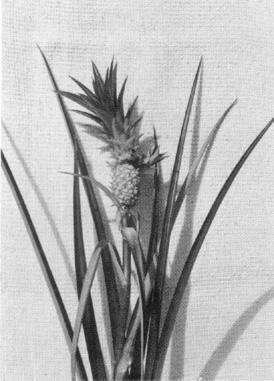 It is useful, however, because the plant itself with its miniature, long lasting pineapple makes a delightful decorative feature in any collection. 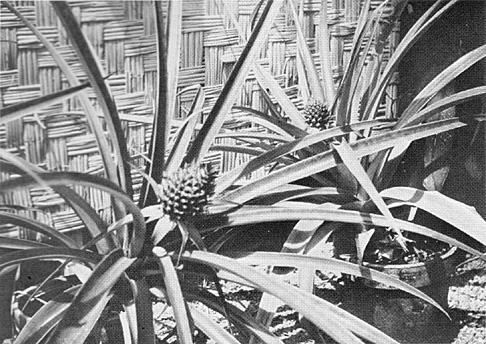 It is easily grown and much quicker to fruit than the common pineapple, A. comosus (sativus). I have planted the top of this dwarf pineapple and had the fruit the following year. The plant suckers readily and grows in interesting clusters with as little attention and care as almost any plant one could think of. In Florida it does well in poor sandy soil or in the well fed heavier soil sections of the garden. It is happy in shade or full sun. Its adaptability is its one great attribute carried over from its native habitat which is in the wild lands of the cooler sections of Brazil; being able to grow also in the cerrado (tired land), the areas where everything seems to fight for its existence, gives this little pineapple a high ratio of adaptability. Ananas ananasoides, typical form, is about twice as large as the "nana" or dwarf form, but in the growth and habit it is quite similar to the miniature form. Its reddish bracts on the fruit stem which is topped with the colorful flower head followed by fruit make it an added sparkling note to any tropical garden. Ananas bracteatus is not only a beautiful and decorative plant for the garden but it bears a very good eating fruit as well, and certainly requires little attention. The red fruit and brilliant red bracts on the fruit and stem remain on the plant for months. We found these growing wild in many sections of Brazil where they were always a source of food to the natives, but we never found them grown commercially. One reason for this is that they grow quite a large top and send out many off-shoots from the bottom of the fruit, so they would be awkward in shipping. The flavor is a little more tart than our familiar commercial pineapple. Its channeled leaves have been used for a very strong fibre. We found a variety of this species growing wild in the state of Sao Paulo, Brazil, called A. bracteatus var. albus with a fruit which is a pale greenish white. This variety is not the best for eating because of its seeds but it is, nevertheless, interesting. Somehow, in Brazil, it took on the name of Ananas cochinchinensis. We found a plant so labeled in the Jardim Botanico in Rio and wondered how this native Brazilian species ever received a name that associated itself with Cochin-China, a country thousands of miles from the native home of the Ananas. Either of these two plants would be an adornment to any collection with its colors of green, white, yellow and red stripes but they are scarce and will be scarce for some-time due to its slowness of reproduction. There being such a small percentage of chlorophyll in the leaf the plant does not reproduce itself very rapidly, so it remains a rare and much prized specimen. Their fruits are quite as delicious as the species form in each variety. 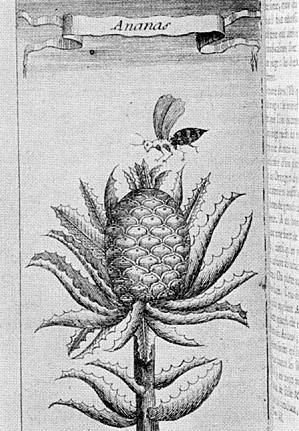 Here is a pineapple which is not exactly a pineapple, but according to its name, Pseudananas, shows it to be a false pineapple. This species macrodontes, we found in central and southern Brazil growing both on the coast within sight of the Atlantic Ocean and then far back into the northwest in the great state of Matto Grosso. This "false" pineapple does not sucker at the base as does the true pineapple, but it sends out long underground stolons. It enjoys a partially shaded area in which its stiff barbed leaves eventually develop into an almost impenetrable thicket. The leaves are generally much longer than those of the common pineapple. The succulent flower head produces a mass of lavender flowers held above delicate pink bracts which remain long after the fruit is formed. Although its fruit has a nice flavor and is interesting, it is not grown commercially. The fruit can be easily distinguished from the other pineapples as it does not have the typical leafy pineapple top. ORTUNATELY, BROMELIADS are subject to few insect pests, but among these is scale, a tenacious annoyance. Noting the cleanliness of plant material in our president's greenhouse, I made inquiry and was told that every other month the house is sprayed with malathion to which a little chlorodane is added. As Mr. Giridlian puts it, "Malathion takes care of the live insects and the chlorodane takes care of the eggs that hatch later." Spraying has its shortcomings in that it is often difficult to avoid being engulfed in the mist drift and to spray the under sides of foliage without spraying oneself. Where there is an enclosed area, smoke fumigation largely obviates these problems. There are several of these products on the market. Some are of an all-purpose nature, while others are specific, such as parathion for mealy bugs, aramite for red spider, and others. With the reputation parathion has, it was a surprise to find red spider resistant to this poison. As a consequence, some powder of both aramite and parathion are used. Although parathion and nicotine are poisonous, other type of smokes are not to human beings. Before using a smoke fumigant, one should determine the cubic footage of his glass-house. Some manufacturers supply their product in cans of 1,000 cubic feet. Should one's area be less, he can pour out some of the powder for subsequent use. In my case, just a rough approximation has been guessed at, and no ill effects have been observed to bromeliads, though the petals of phalaenopsis are sometimes lightly "pepper" spotted. The powder is lit by means of sparklers, such as those used on the Fourth of July, but instead of lighting the tip, one lights the base or area closest to the hand. The ignited sparkler is plunged into the powder in the can. One can easily light two cans in a smallish house before the smoke gets near one by igniting them as one backs toward the door. The foliage of the plants should be dry. Generally I use the smoke in the late after-noon. I prefer to allow a full day to transpire before entering the greenhouse. Then I open the door, next the vents, and spray the foliage of the plants. Perhaps this is not necessary, but many of my plants are suspended from the pipes supporting the greenhouse, and it is impossible not to brush one's face against some of the foliage as one passes by. The bromeliads have been a source of attraction to many visitors throughout the year. One can admire some flowering plants at any time of the year. 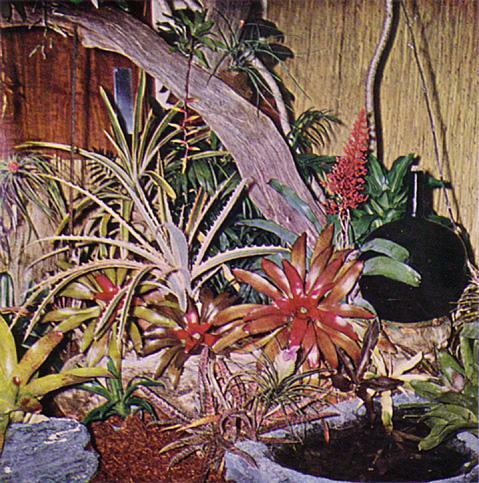 Several larger groups consisted of Billbergia pyramidalis, Billbergia × breauteana, B. nutans, B. macrocalyx, B. vittata, Aechmea 'Maginali', A. weilbachii, A. bracteata, A. recurvata, A. 'El Morro', A. 'La Espriella', Portea petropolitana, Neoregelia princeps, Aechmea lueddemanniana, Pitcairnia sulphurea, Vriesia splendens, Dyckia brevifolia and Aechmea calyculata should also be mentioned. All these plants have flowered this year, some for several months, while others such as the Aechmea 'El Morro' and 'Marginali' are particularly showy when fruiting. The new compost used since November, 1962 consisting of 60 per cent rice hulls, 30 per cent peat and 10 per cent fine sand has proved to be very successful for all bromeliads. It is noteworthy that the change in feeding from Gro-mix (6:9:6) in the nursery, to Aquasol or Urea Plus in the Bromeliad House, does not show any adverse effects. Labour saving liquid feeding is preferred to solid mixtures because of the large quantities of plants to be fed in the Schomburgk Range. Certain kinds at least of the bromeliads liberate into the water of the leaf-cup a water-soluble gummy material; this by evaporation at the leaf edges in a dry environment may cement them so firmly that growth does not free them. Mainly the difficulty arises with varieties having thin, smooth leaves; those with stiffer leaf texture usually break free. Thin leaves readily crumple as they grow within the confinement of the cohering outer ones, and may become hopelessly entangled. I recently noted this tubular type of growth on some offsets of Guzmania lingulata and was able to overcome it by the simple expedient of misting the plant several times at short intervals, after which by running a pencil tip under the leaf edges I readily freed them; previously they were so tightly held together that they could not be separated without tearing. I would suspect that there would be little such trouble in humid regions, or in greenhouses where fog nozzles are used. Local differences of relative humidity from variation of air circulation, etc., even with the plants only a short distance apart, could readily account for the spottiness he notes in the incidence of this difficulty. 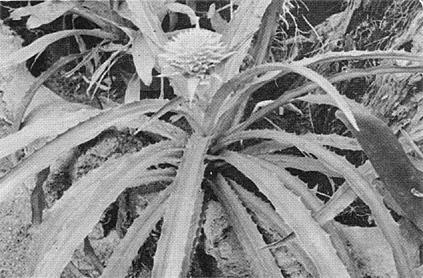 Epiphytes growing in the wild, certainly, cannot receive any great quantity of the trace elements mentioned. I wonder if "crookneck" on terrestrials, and cemented leaves on epiphytes, are actually distinct phenomena, with separate causes and cures, in spite of such superficial similarity as they may display. —Roger K. Taylor, Winter Garden, Fla.
"Vriesea splendens in our collection grown in a heated glasshouse usually flowers October-November (early summer in the southern hemisphere). I recently took a plant home in October with a bud just showing. In the lower temperature and greatly reduced light intensity the flower didn't mature till mid-autumn. This might be of use to commercial growers—control of flowering date. Mr. Martin, the Society's New Zealand Trustee, told me of a small Tillandsia (species unknown) the spike of which stopped flowering half way up as temperatures dropped during the autumn. When they rose again in late spring, the spike continued again from where it had left off, much to his amusement. Vriesea splendens has a very interesting mechanism for spreading its seed about. The seed is like thistledown and when moist sticks to anything. In a moist atmosphere the pod remains closed but opens as humidity drops. Presumably this is because on a wet day the seed would just stick to anything around the parent plant, whereas on a dry day it might blow for miles before settling, thus aiding the plant to spread into suitable habitats. I have noticed this when removing ripe spikes from humid greenhouse to dry storage cupboards, the whole spike of pods opening in about two days." —William Rogers, Auckland, New Zealand. "For some reason, mainly because bromeliads are so hardy, growers sometimes leave a plant out of a pot for several days or send a plant a long distance without moisture at the root. This practice seems to be harmless, because the leaves do not droop and when the plant is finally planted, it looks all right. Actually some harm is caused although nothing is obvious for long periods, but eventually we are disappointed when suckers fail to appear and the plant seems to remain dormant. "What happens in such cases is that the roots becoming dry lose their ability to feed the plant. In reality the roots die and the plant lingers on by its feeding from the tanks only and the sucker area on some varieties is dead. On examination one can see that these roots have no life whatever, and the loss of suckers probably in a valuable plant can be very disappointing. The remedy for this, of course, is to make sure that no plant is allowed for a long time to be without moisture. In case of transporting plants, one should wrap the roots in damp moss or even damp tissue paper, and over the moss place a small plastic bag to hold in the moisture, being careful not to allow the plastic to extend to the leaves, as sweating can do damage." —W. B. Charley, Bilpin, Australia. ROM Mulford B. 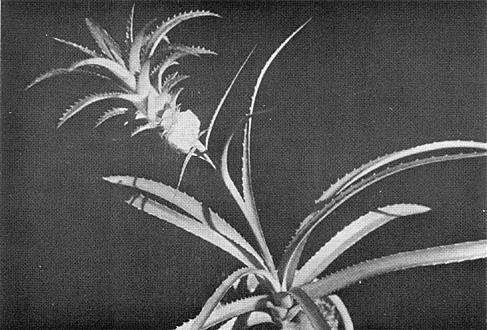 Foster comes this correction as to the proper name of the Tillandsia shown on the cover of Issue No. 1 for this year. He writes: "This plant is Tillandsia stricta from Brazil. Tillandsia foliosa with its tall slim inflorescence with bright red bracts is from Mexico; it looks nothing like T. stricta. Ole Hein, who lives in a small apartment in Copenhagen, Denmark, describes how he grows his plants. "We live in a little apartment, and the living room is approximately 4 by 5 meters. It is heated by an ordinary coal stove. I made a wooden box 1½ meters long, 50 cm. broad and about 40 cm high, and filled it with sphagnum. I lined the wall behind the box with some yellow brick plates, so that it looks like a raw brick wall. I placed two florescent tubes, each 40 watt, 1½ meters above. On the wall I have placed 6 cork-bark pieces in different positions and in these I put the pots. I have growing the following: Aechmea fasciata, A. fulgens var. discolor, A. ortgiesii, A. weilbachii, Cryptanthus bivittatus, C. bromelioides, C. zonatus zebrinus, T. cyanea, Vriesea splendens, V. psittacina, Neoregelia carolinae var. tricolor. I got all these plants, some of them only as offshoots, from the botanical garden in Copenhagen. Bromeliads are not very well known in Denmark, and it is almost impossible to get literature about them." 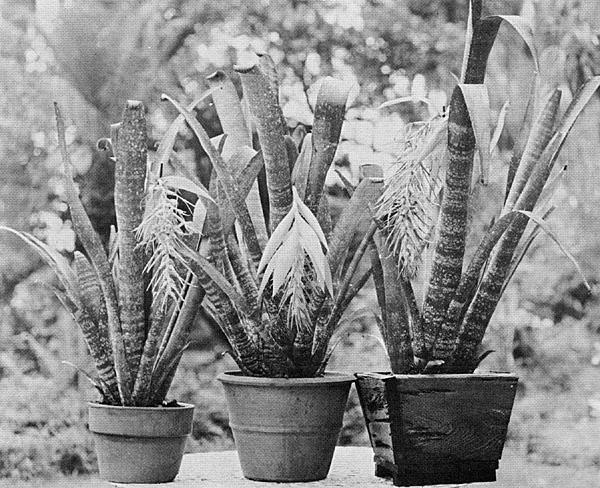 Mrs. Florence B. Burt of Florida speaks of her love of bromeliads: "For two years I have known and grown bromeliads. Due to being on crutches for over five years, I was forced to sell my general nursery stock, so I gradually drifted into bromeliads. Even my husband, a retired Navy man, has become interested in them. We just 'live' bromeliads! My 3,000 plants are not the newest or most rare, but are nice. We gloat over Exotica and Wilson's bromeliad pictures and your Bulletins are read 'thin' as they are by my pillow with my Bible." Our trustee, Mrs. Adda Abendroth from Teresopolis, Brazil, always has much of interest to say. Speaking of V. × 'polonia' she writes: "Oddly enough I have in bloom a plant much like it, the only difference being that the spike has 2 branches instead of 8 as in your picture. It was left over from a lot I collected for Mr. Barry in a neighboring forest in 1960." She also gives some hints as to holiday decorations: "Bromeliads were used largely this year in Christmas decorations by putting to work the Brazilian knack to get around difficulties: the eye-catching parts of the plants get coated with paint and are used in table arrangements. Stiff Vriesea spikes, Aechmea fasciata torches, Tillandsia stricta tufts, long threads of Tillandsia usneoides look pleasing enough, but to me it is all in the wrong direction." From Peter Cox, of Hatfield, Pennsylvania, comes this interesting communication: "We have had 94 bromeliads on display at the Pennsylvania Horticultural Society in Philadelphia for 18 days; in fact, one large Puya still must be brought home. The round trip from Hatfield to the headquarters is about 75 miles, so, with 20 round trips required to transport the plants we traveled close to 1500 miles. The display included representatives of 18 genera, with only two varieties duplicated. One of the benefits accruing to us was a handsome bromeliad family tree, commissioned by the Horticultural Society, showing the family "trunk" splitting into three sub-family "branches", with 45 genera dependent as "leaves". This was done on 3 by 5-foot poster-board, and is most effective. The exhibit was a great success, not only with casual visitors (the Society's headquarters is in the Independence Hall National Park area, and posters invite visitors to view current exhibits), but also with the Society's members who attended three large meetings held during that time. Mrs. Ernesta Ballard, Executive director of the Society said, "Marvelous show; the best we've had." They have at least one a month. "We have been asked to prepare an exhibit for the annual flower show of the Delaware Valley College of Agriculture on May 1 and 2. This will be on a small scale, and is, fortunately, only ten miles from home." For those who found Exotica III a little too high priced for their budget comes this welcome news from Alfred Graf of Julius Roehrs Co. He writes: "I am now working on a popular edition or 'Baby Exotica' entitled Exotic Plants To Live With, which will show all the popular bromeliads, as well as exotic families in a format 6 x 9 inches, with about 300 pages. This new book will have a popular approach and may show some 1500 plants and four color pages, including bromeliads. The price will be under $10." Mrs. Beryl Allen, who started the bromeliad round robin in its way, finds the many letters which she receives most fascinating and worth while. A Catholic priest who once grew bromeliads in Montana and is now with the air force in Alaska is one of her correspondents. Mrs. Allen was honored at the last meeting of the Bromeliad Guild of Tampa Bay for her efforts on behalf of the round robins which she directs. Among the renewals and new memberships received this year, three were for life. We deeply thank Madam Ganna Walska of Santa Barbara, Mr. Edwin S. Marks of New York City, and Mr. Rychei Ishikawa of Tokyo for their generous support. Renewals and requests for membership have exceeded all previous records. FROM THE EDITOR'S DESK—Have you had any interesting experiences in growing your bromeliads? Have you a pet plant that you are proud of? Have you taken some photographs which you think are particularly good? All articles and pictures are earnestly solicited by the Editor who at this time is sorely in need of comments and articles by the members themselves. Past issues of the Bulletin are becoming very scarce. Please refer to Page 89 for volumes still available. The only single issues to be had are the following: Vol. IX, Nos. 3, 5, 6; Vol. X, Nos. 3, 4, 5; Vol. XI, Nos. 2, 3, 4, 5; Vol XII, Nos. 2, 5, 6; Vol. XIV, Nos. 2, 3, 4, 5, 6. These are one dollar apiece, plus 10 cents for postage. —Our deepest thanks go to the Bromeliad Society of La Ballona Valley, Culver City, California, and to the Bromeliad Guild, Los Angeles, California, for their generous donations toward colored illustrations for the new handbook which is now in preparation. The money for these donations was raised by plant auctions. It is hoped that other affiliates will also help this worthy cause. Dr. George Milstein, President of the Greater New York Chapter, writes as follows: "I am enclosing a picture of the New York Chapter's exhibit at the 48th International Flower Show at the New York Coliseum in March. The picture shows the prize winners on the left and the chapter exhibit of a section of a bromeliad jungle on the right. First prizes were won by Frank Hausman, George Milstein, Norman Pomerantz, and Dr. and Mrs. Milstein got a sterling silver bowl for the design of the entire exhibit. Next year we will have more than twice as much space and we hope some of our bromeliad friends from other parts of the country will join us and eventually perhaps the national organization will take part in the educational part of the exhibit." Charles Wiley, President of the Bromeliad Guild of Los Angeles, has this comment to make: "At the March meeting of the Bromeliad Guild of Los Angeles, David Barry, Jr., showed some slides of bromeliads and of his visits to some of our far-flung members, including Mrs. Adda Abendroth of Teresopolis, in the Organ Mountains, Estado de Rio, Brazil, and to Mr. Rychei Ishikawa, our most recent life member, of Tokyo. Some of the slides of notable bromeliads were of Canistrum ingratum × roseum in flower, a rare occurrence, and Vriesea × 'Polonia' with its branched spike of varnished red." President Warren Cottingham of La Ballona Valley Bromeliad Society, with headquarters in Culver City, California, wrote in the following: "To create an interest in bromeliads among the people of the Valley, we are entering many of the flower shows put on by the local garden clubs. In fact, the Women's Club asked one member to speak on rare plants—what else but bromeliads. A return engagement has been set up. We believe this to be a fine start for a two-year beginner. Also there is competition among our members within the club to exhibit for points with a trophy to the winner at the end of the year. Our programs have been of the highest caliber our chairman could get for us as infants in the world of bromeliads. Visitors are most welcome." THE BROMELIAD GUILD, Los Angeles, California. Meetings: Third Sunday afternoon on alternate months starting January. President: Charles Wiley, 4036 Via Solano, Palos Verde Estates, California. BROMELIAD SOCIETY OF LA BALLONA VALLEY, Culver City, California. President: Warren Cottingham, 10717 Oregon Way, Culver City, California. BROMELIAD GUILD OF TAMPA BAY, Tampa, Florida. Meetings: First Tuesday every month at 7:30 P.M.
President: Ervin J. Wurthmann, 5602 Theresa Rd., Tampa, Florida. 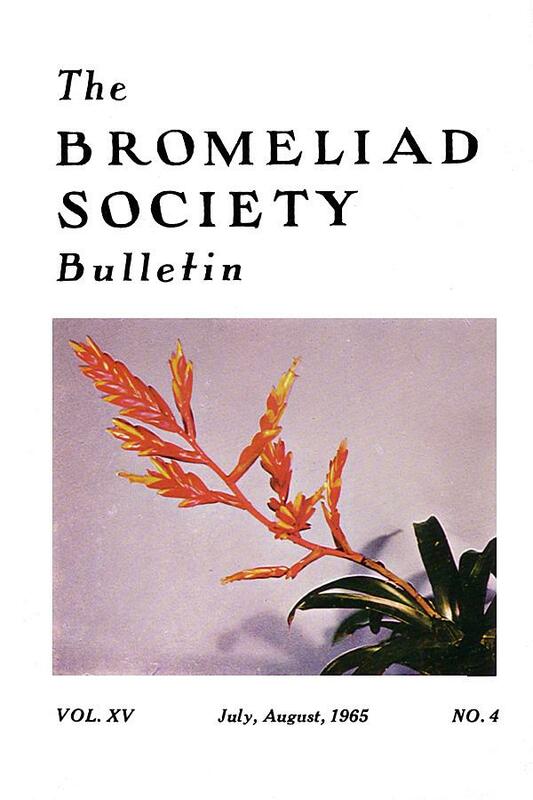 BROMELIAD GUILD OF GREATER NEW YORK, New York, N. Y. Meetings: First Tuesday of each month at eight o'clock. President: Dr. J. G. Milstein, Telephone: Shore Rd. 5-4228. LOUISIANA BROMELIAD SOCIETY, New Orleans, Louisiana. Meetings: Fourth Wednesday January, March, May, June, September, November. President: Mrs. Charles L. Brown, 27 Neron Pl., New Orleans. BROMELIAD SOCIETY OF SOUTH FLORIDA, Miami, Florida. President: Ralph W. Davis, 15500 NE 9th Ave., North Miami Beach. BAY AREA BROMELIAD SOCIETY, San Mateo County, California. President: John M. Riley, 3370 Princeton Ct., Santa Clara, California. BROMELIAD SOCIETY OF NEW ZEALAND, Auckland, New Zealand. President: William Rogers, 14 Royton Ave., Mangere East, Auckland, N. Z.
Palos Verdes Estates, Calif. 90275. This exhibit by the Bromeliad Guild of Tampa Bay was made in Florida's First All Bromeliad Show at the Bank of Clearwater, Florida, honoring Mulford B. Foster on April 11 and 12, 1964. This exhibit won a special award for a society or guild. There was a total of 78 different bromeliads in this exhibit. Those of the Guild taking active participation in setting up the display were Mrs. Frances Allen, Mrs. Beryl Allen, Mrs. Roy Marr, Charles Perez, Mr. and Mrs. Harry Cunningham, Jr. and Mr. and Mrs. Ervin J. Wurthmann. —E. J. Wurthmann, Tampa, Florida.